I'm not sure about you guys, but I always enjoy having puzzle games on the go. 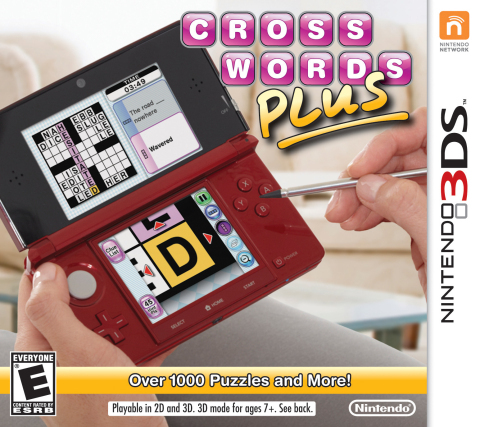 Enter Crosswords Plus, the new puzzle game from Nintendo that has over 1,000 crossword puzzles of varying difficulty built in. That in and of itself is a lot of content, but Nintendo didn't stop there. Included are over 200 Wordsearch puzzles, over 1,000 Anagrams to solve, and the Word of the Day with Word Paths. Retail box art. Image courtesy of The Nintendo Wiki. The basics of Crosswords Plus is relatively simple. It's broken down into four games, and each game uses the touch screen heavily. To keep this review brief, I'll just give a basic explanation of how each game works. Crosswords. On the top screen, you get a general overview of the puzzle at hand as well as clues for the vertical (down) and horizontal (across) words that you are working on. On the touch screen, you write out your guess letter by letter. If you have Assist on, it will let you know if your guess is incorrect by highlighting it red. Stumped on a clue? You can purchase an additional clue, a letter, or the entire word using Hint Points. Each puzzle has a set number of hint points, but they will add a time penalty. On top of all of the built in crossword puzzles, SpotPass delivers weekly puzzles right to the game. You can also enable StreetPass to exchange bonus puzzles with other players that you cross paths with. Wordsearch. The top screen gives you all of the words you're looking for, and it's up to you to find them on the touch screen. Press down on your first letter and drag the stylus left or right, up or down, or diagonally to the last letter of the clue and release. Completed words will be marked off on the top screen and highlighted on the bottom screen. Anagrams. You are given six letters on the bottom screen, and it's up to you to come up with as many three or more letter words as you can. Drag the letters into the boxes at the top of the touch screen, and press the check mark in the bottom corner to see if it's a word. If it is, it will go into the list on the top screen. Words are grouped up there by the number of letters and in alphabetical order, so it gives you an idea of what words you're missing. Word of the Day. On the main menu, click Word of the Day to learn a new word each day. Once you're introduced to the word, you can play Word Paths, which takes the word you just learned and puts it into a small puzzle. The word leads the way, and you have to get to the end of the path by coming up with your own words. Alternatively, every few days you're given the chance to play Word Quiz instead of Word Paths, which gives you three multiple choice questions based on previous words you've learned. The interface of the game is clean and easy to navigate. The touch screen is responsive, but it does have issues figuring out what letter I'm trying to write from time to time. I'm not sure if that's a knock on my penmanship or if it's something within the game itself. Graphically, you have a very basic package that gets the job done. The clues and such are easy to read, but aside from some subtly animated backgrounds and colored buttons, there isn't much there. The 3D effect is present when you complete a puzzle (and honestly feels like an afterthought), but it disabled via software when you're working on puzzles so you don't have to keep adjusting the slider if you don't want to. The music is optional, but is very soothing if you choose to enable it. The sound effects aren't intrusive and sound just fine. The one gripe I have about Crosswords Plus is the price. $29.99 (both at retail and in the eShop) seems a bit high even with the sheer amount of content crammed into it. $19.99 would have made this a much more attractive package. Trailer. Video courtesy of Nintendo via YouTube. Crosswords Plus is a fun game to have when you want to pass a few minutes or spend a while exercising your brain. It's the perfect game to go digital with, especially since it doesn't require much space on your SD card (128 blocks). Go ahead and give it a download if you have some spare change. Good review, I agree on pretty much all points. This game reminds me of why I enjoyed the original DS so much. A unique, not-quite-a-videogame-but-yet-it-is experience that works perfectly on Nintendo's portable. Good stuff. Yeah, it's ideal for short bursts or long plays. Last night, I started and finished the last Giant Crossword (51x51), and it took me almost two and a half hours (and I got an Excellent rating). One thing I liked about the original DS game was the way you held the DS sideways in book style. So much more comfortable to hold for long stretches, and it makes me sad that because of the 3D screens we can't do that with Crosswords Plus. I have The New York Times Crosswords on DS which is pretty cool. And Shirley liked it too. Don't know that I need another Crossword game. They are more addicting than you might think. Looks interesting, and I've never been a fan of crosswords puzzles. I may give it a go someday. If ever this gets to 20 bucks I'll pick it up. The multiplayer in NY Times Crosswords was awesome, you could either play competitive or cooperative. Why can't you give us download play multiplayer, Nintendo? Word Paths sounds neat! But eesh, $29.99? I'm with you, far too much. I mean, balanced against those JUMBO books you can get at your local grocery store alone.. I get the portability and "keep it fresh" stuff, but someone has gotta LOVE LOVE LOVE crosswords for 30 bucks. Which mode did you find yourself coming back to the most, Ludist?